The Tudors ruled England from 1485 until 1603 during one of the most exciting periods of English history. 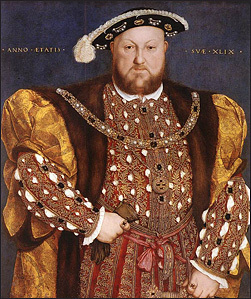 During these tumultuous times England experienced immense change caused by the Renaissance and Reformation, involved itself in wars with the great powers of Europe and spawned some of our most fascinating monarchs, not to mention being the era that brought us Henry VIII’s wives! Our story begins with Henry VII winning the Battle of Bosworth, ending The Wars of the Roses and establishing his Tudor dynasty. From here the Tudor story will take us to Henry VIII, his wives and his court, the lives of the Tudor Queens; Mary I, Elizabeth I, Mary Queen of Scots and Lady Jane Grey and to such great events as the defeat of the Spanish Armada that would forever change the way England is viewed by the world. No study of the Tudor era would be complete without also exploring the lives of ordinary folk and how things changed for them when events like the Protestant Reformation swept through Europe. If there are any topics you want to see included please contact me, I’m always happy to hear from other Tudor fans! If you’re new to Tudor history a good place to start is by finding out Who were the Tudors? Or you can take a look at the Tudor’s Family Tree ….. This entry was posted in Tudor Info and tagged Tudors by admin. Bookmark the permalink.